Students who actively participate in lessons improve both behavior and academic performance. No matter how well a teacher has crafted their lesson plans, or how top-notch their adopted curriculum might be, they must still engage students so they’re able to adequately assimilate the lesson content. With Anita L. Archer’s Active Participation: Getting Them All Engaged, Secondary Level, teachers in grades 6-12 will learn how to engage all students in the classroom, from star performers to struggling students. This set of four DVDs demonstrates specific instructional procedures and routines to increase engagement, on-task behavior, and accountability; promote desired behaviors and reduce inappropriate ones; and keep the class briskly moving along. The DVDs can be used both to introduce teaching staff to active engagement strategies and to periodically serve as a systematic review of engagement strategies for staff who are familiar with the concepts, but need a quick refresher.Included are four DVDs, plus one CD that contains reproducible session handouts and a facilitator's guide. 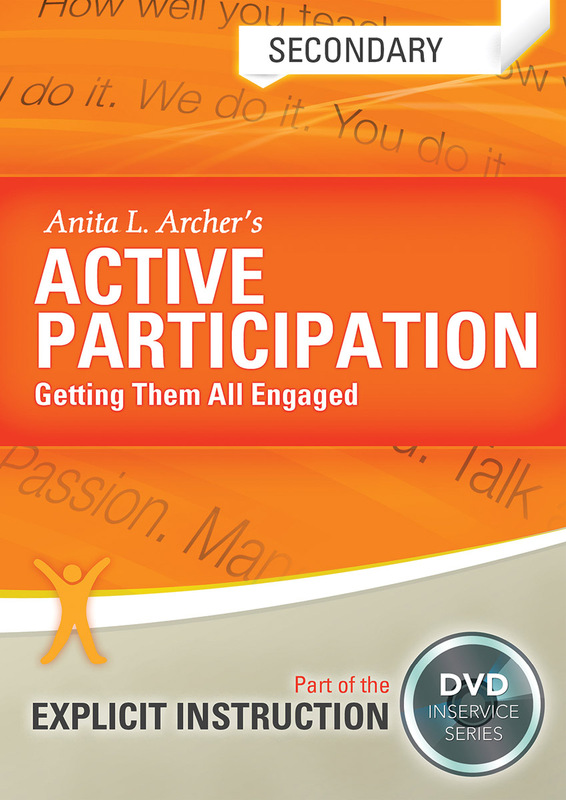 Also see Anita L. Archer’s other DVDs, Active Participation: Getting Them All Engaged, Elementary Level for grades K-5, and Golden Principles of Explicit Instruction, which covers everything from the management to the delivery of explicit instruction using engaging four- to seven-minute video presentations. Plus the book Explicit Instruction, from Anita L. Archer and Charles A. Hughes, provides practical tools to implement explicit instruction in any grade level or content area.